2/12/93 – Sean arrived at our door early in the night: the first time he’s done this rather than crying for one of us … [later] it was decided, after Pauline had rung Holles Street, that Susanna should be taken to see the doctor there, so Susanna, Nuala and Pauline went off in the car and Sean and I ‘did runnings’. 3/12/93 – We had lunch and then everyone except Susanna and me went to Dundrum. The nurse called after they got back to do a heel test on Susanna; the first one hadn’t worked. Sean and I did runnings upstairs while she was here. It has been decided that the sander is too loud for Susanna’s ears, so they’ll all be going away for a couple of days soon so that I can get it done. 7/12/93 – I rang Pauline. They’d gone to the hospital on the way to Warrenpoint. Susanna is fine, and 10 lb. They also went to a baby massage class. 10/12/93 – Sean helped Peter and Liam O’Hare to put in a new boiler today. 12/12/93 – The ICT Christmas party was good – Eleanor and Alan were there, and lots of other children and parents. I brought Susanna in the sling, and she was very much admired. Sean had a great time running around, and got a digger from Santa Claus, supplied by us. Paul arrived and gave us a lift home, with Sean and me sitting on a tyre in the back of the van. 14/12/93 – The man came to lay the carpet around 9.30. It didn’t take him very long … The postman gave us some stuff for Mrs Waugh next door, as one item wouldn’t fit through the letterbox. He asked Pauline to have a word with her about her dog. 15/12/93 – Found one of Sean’s marbles under the newly laid carpet and had to remove some staples to retrieve it. We got the Christmas tree up and lit/decorated. Sean went to see Santa Claus in Dundrum earlier. 16/12/93 – Pauline, Sean and Susanna went to the ICT playgroup. 17/12/93 – After lunch I took Sean to the Nutgrove so that Pauline could get some sleep. Bought two mattresses for the bunk beds. We had a drink in the café and went to the supermarket. Sean was in the toy section for a long time, but was tired and got emotional when I finally prised him out. He fell asleep on the way home. Pauline had had a good sleep, as had Susanna. 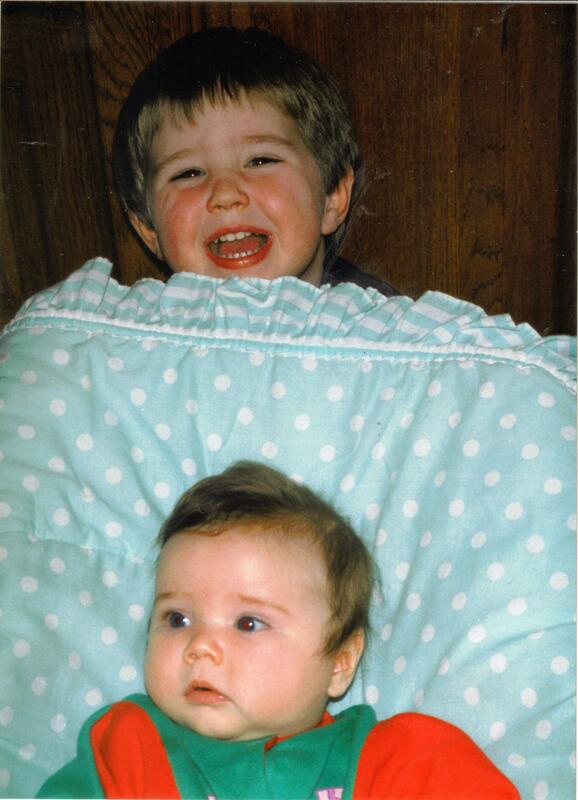 19/12/93 – I went out for a paper, and took Sean to the park in the afternoon: he fell asleep as planned. I did two hours’ sanding while the other three were asleep. 22/12/93 – While Pauline was feeding Susanna around five she got a very bad pain in the chest, which didn’t go away … her pain didn’t ease much all day, although she was taking paracetamol. In the afternoon I called a doctor … and he came to see Pauline. He diagnosed gall bladder trouble and gave us a prescription … he had given her an injection which he said would kill the pain till the morning, but it didn’t, so I rang him and he rang a surgeon … Pauline was admitted [to Mount Carmel hospital] and I held Susanna and waited. She was much admired by all the nurses … It was agreed that Susanna should stay the night with Pauline, as Pauline was keen to persist with the breastfeeding … [later] I had a beer next door and chatted with Sean Sr and Aileen while Olivia and Sean Jr played, defying tiredness. I took Sean away under protest and got him to (the big) bed when he had calmed down sufficiently. I climbed in beside him, and lay awake thinking and worrying about Pauline for some time. 23/12/93 – Had breakfast, played, called Pauline. She had had a fairly restless night, but Susanna had slept well … I took Sean to Dundrum in the buggy … he was generally good, but wanted badly to see mummy at one point. I walked him home again, played, tidied the place up a bit and started the dinner, with which Sean helped … I called Pauline twice more – she had been put on antibiotics and it looked as if she’d be able to avoid surgery. My dad arrived around 8 and we had dinner. He gave Sean a dinosaur for Christmas, and they were quite taken with each other … My dad told me that he probably has Parkinson’s disease – he has been to see a specialist and has to see another one soon. We are sitting up having a quiet beer. 24/12/93 – In the afternoon my dad, Sean and I got a taxi to the hospital and were with Pauline and Susanna for a while. Pauline was quite yellow with jaundice … [later] Mick called and invited me over for a drink; I took Sean over but, to his disappointment, Brian was already in bed … Sean was up quite late, and I then had to bring his Christmas present in from the shed and assemble it. 25/12/93 – Sean woke me at 4.20 talking about spiders downstairs, and insisted that he come downstairs with me for his milk. He then insisted that I turn the kitchen light on (I’d been hoping he wouldn’t see his present). When he saw it he said ‘My slide!’ and was delighted with it. I let him play on it for a few minutes and then took him back to bed. We got up around 10 and Christmas Day proper began. I rang Pauline – she would be able to come home for a few hours as she had hoped. I cooked a big dinner, helped by Sean – he always insists on helping with the dinner these days. Roast chicken and potatoes, cauliflower in white sauce, Brussels sprouts and parsnip. Carrot cake to follow. Pauline got home (in a taxi) with Susanna just before I served it up. Sean wouldn’t eat any; my dad and I had too much and left a good bit. Pauline had had her low-fat Christmas dinner at the hospital. [We spent a good bit of time at the next-door neighbours’; Pauline and Susanna went back to the hospital.] Sean, on being brought home, screamed the house down while I was trying to get him to bed. For my dad, Pauline, Sean and me this was our second Christmas in Dublin. It was Susanna’s first. 26/12/93 – In the afternoon I took Sean in the buggy to the hospital. I had hoped to leave him with my dad, but he had made too much of a fuss. He fell asleep on the way (it took me about 35 minutes to walk to Mount Carmel) and only woke up when we were nearly home, to ask ‘Where’s the hospital??’. Pauline and Susanna were fine. 27/12/93 – Pauline got the all-clear to come home … Pauline and Susanna duly arrived during the afternoon, as did Peter and Nuala … My dad left in a taxi, then everyone else (except me) left for Warrenpoint. 31/12/93 – I went next door around 10. Aileen, Sean and I had several beers and good crack. At 12 we went out on the street and shook hands with a few people. Then into a house a few doors down (Damian and Sally’s?) … We had a couple of drinks, then back to next door. I left around 1, quite drunk. 6/1/94 – Rang Pauline to comment on the snow which was falling heavily and lying on the ground. Ventured out only for a paper. Kids were making snowmen and so on. There was less snow in Warrenpoint, it seems, but enough for Sean to play around with. 12/1/94 – Sean woke this morning [in Warrenpoint], sat up in bed and said ‘Daddy’s in Warrenpoint’, then went around the house looking for me. 13/1/94 – Rang Pauline – they had been at a playgroup today and Sean had had a great time. 15/1/94 – They arrived around 4.30. Susanna, of course, had come on a lot since I’d seen her, and had filled out. Sean was very pleased to see me. 16/1/94 – We went to the playground at Sean’s request. It was very cold. 22/1/94 – Sean was exceptionally sweet and good all day. For the first time, he was saying ‘you’re welcome’ when someone thanked him. 25/1/94 – Pauline left Sean to the playgroup, which he now likes. 26/1/94 – In the supermarket, Sean ran to the far end of an aisle, shouted ‘Mummy I love you!’ and ran back laughing. 3/2/94 – Eleanor and Alan called in the morning. After lunch they, Pauline, Sean and Susanna got a taxi to Pirate Pete’s and a bus home. They got soaked. 8/2/94 – Susanna had her first ‘solid’ food today – a few spoons of baby rice. 14/2/94 – Sean has a bit of a cold and says that he has ‘swallowed his glands’ (Pauline said yesterday that he had swollen glands). 15/2/94 – When Sean got home he and I made a snowman in the back garden. 19/2/94 – I got up in the morning with Sean and Susanna, and took Sean out for a paper to the shopping centre. He insisted on going into the crèche, so I bought some groceries. 21/2/94 – Andrew was delivered around 9.45 – it was midterm break and Aileen had asked Pauline to mind him for the morning. Sean was thrilled to have Andrew to play with. 25/2/94 – My dad arrived in a taxi at 5.20, having been to see a specialist in St Vincent’s about his Parkinson’s disease. The specialist told him that it’s a mild form of the disease, and can easily be cured – my dad was thrilled about this; he had been anxious and depressed for much of the past few months.